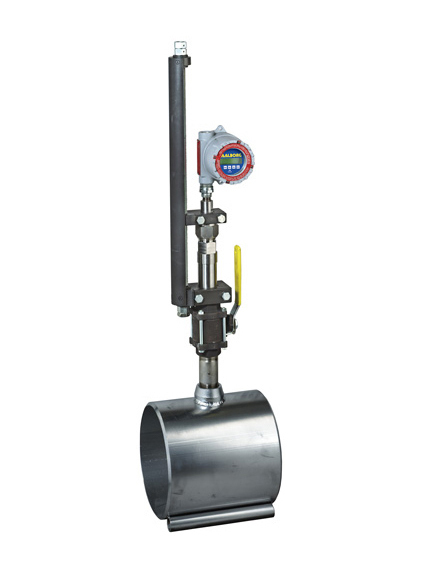 Insertion Vortex Flow Meters indicate volumetric and/or mass flow rates of gases, liquids or steam in piping conduits. Vortices are created when a fluid passes around a bluff body as shown in illustration (click Images Tab above). Vortices are alternately shed on each side of the body, 180 degrees out of phase to each other, resulting in an oscillating pressure gradient. As flow increases the frequency of vortices increases in proportion to the increased flow thereby creating a linear relationship. Constructed of type 304 or 316 stainless steel, Vortex meters may be inserted into pipe conduits carrying gases, liquids or steam. Insertion applications facilitate inside diameters from 4” to 12 feet! By porting directly into piping, conduit lines need not be lengthened. Optional isolation valve permits installation, servicing, or removal of vortex meters without having to shut gas, liquid or steam processing operations. measuring units; programmable flow alarm; two programmable totalizers; programmable flow rate pulse output; two programmable optically isolated outputs; battery backed real time clock (RTC); digital communication interface (RS-232 or RS-485); programmable diagnostic events log and register with date/time stamp; programmable process variable log with date/time stamp; calibration and flowing fluid parameters adjustment; extensive diagnostics. 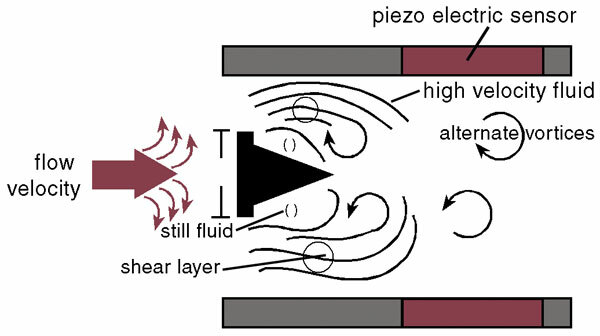 Aalborg's unique dual signal processing technology independently measures each vortex on either side of the bluff body and filters out non-flow noise. This results in less noise and higher accuracy throughout the flow range. User preset temperature and pressure information processed by an on board computer to calculate density and mass flow. Local 2x16 LCD readout provides simultaneous volumetric and mass flow readings, total flow volume reading in selectable engineering units, diagnostic events indication, and password protected - user entered parameters.